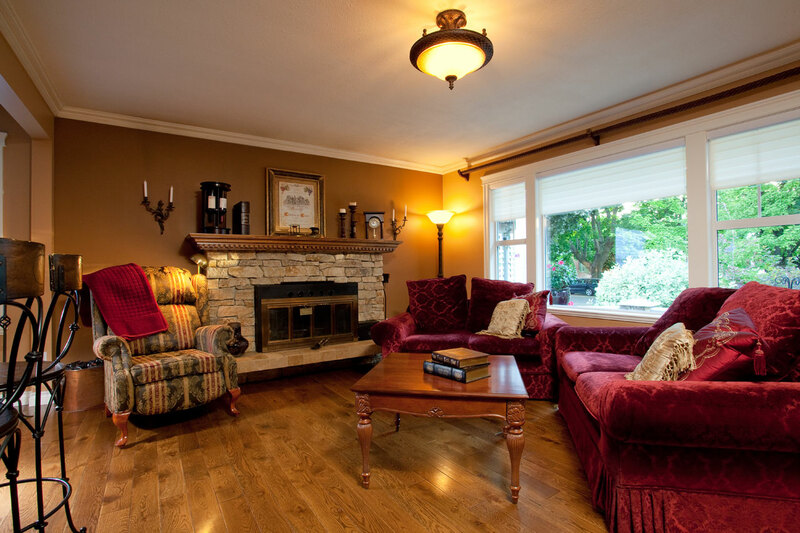 Okanagan Hardwood Flooring . . . . creating beautiful floors since 1964. Finished on-site, unfinished solid hardwood flooring offers the most flexibility and customization with a wide choice of wood species, widths and lengths. In addition, many wood species can be stained prior to finishing. Available in a variety of North American wood species as well as exotic hardwoods from around the world - the choices are endless. Unfinished flooring allows for more creativity - inlays, borders and medallions - as well as flush-mount air vents, giving you a "one of a kind" floor. 100% solid wood from top to bottom; ¾” thick. installed, sanded and finished on site. nailed or stapled over a wood subfloor. installation on or above ground. many species can be stained prior to finishing. variety of finishes available - satin, semi-gloss, gloss and more. 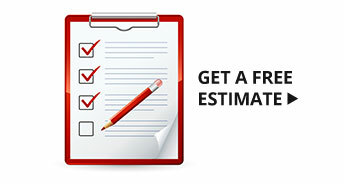 acclimation of wood prior to installation is required. sand and refinish 3 to 5 times over the life of the floor. Prefinished solid hardwood flooring is a ready-to-install product that has already been sanded, stained and finished with multiple coats of protective coating. The finish is applied at the factory, in a controlled environment for long lasting results. 100% solid wood, ranging from 3/8" to 3/4" thick. nailed, stapled or glued over a wood subfloor. extremely durable finishes - multiple coats of acrylic, urethane, aluminum or titanium oxide and UV cured are the most common. wide variety of colours and textures such as hand scraped; domestic and exotic species available. sand and refinish possible on most products over the life of the floor. the top layer is cut from a variety of North American hardwoods as well as many exotic wood species. ranges in thickness from 1/4" to 9/16", and from 2 1/4" to 10" wide, in random lengths. available in single plank, wide plank, two-strip and three-strip. multiple layers of durable aluminum or titanium oxide, UV cured urethane and acrylic finishes are factory applied. 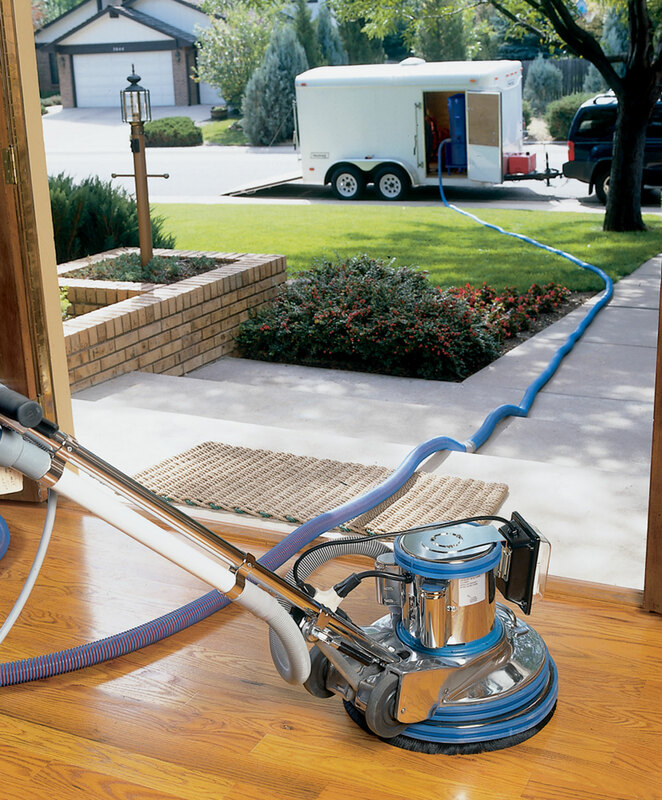 perfect for below grade installations, over concrete subfloors and radiant heating systems. Floating Floors have a glueless tongue and groove locking system that allows for a faster completion time, and you can take up the boards at a later date. 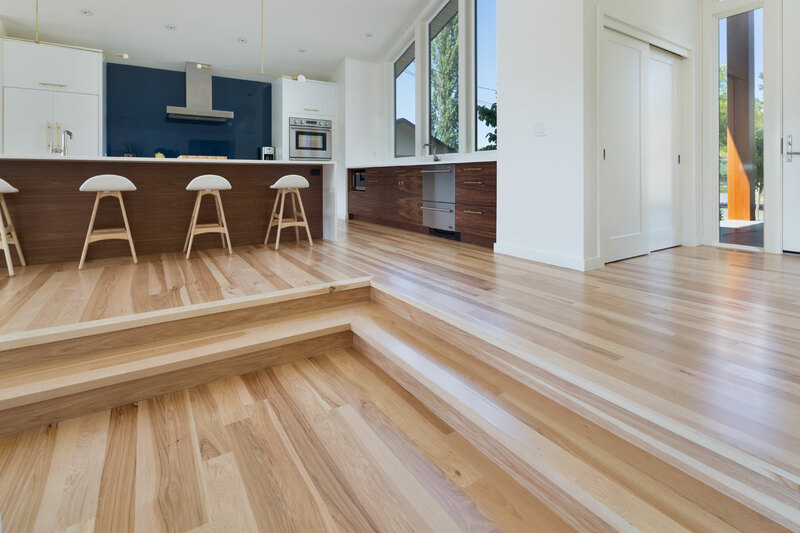 depending on the thickness of the top layer (or wear layer), some engineered floors can be refinished. used in conjunction with our sound barrier systems is a perfect application for apartments or condominiums. 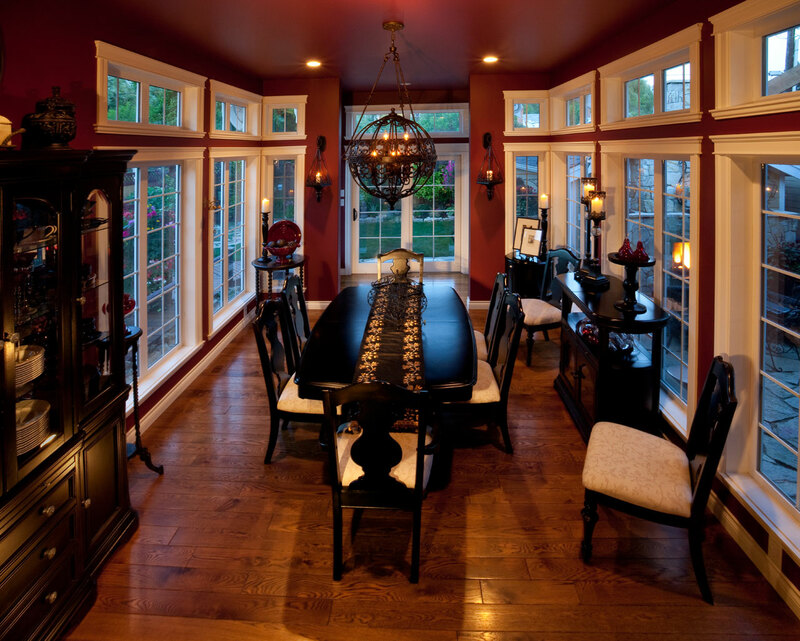 Wide plank hardwood floors have become one of the most popular flooring choices in recent years. Wide plank flooring is manufactured rom new and reclaimed woods in wider width and longer length planks which reduces the number of end and edge seams in your floor. Perfect for customization, this type of flooring can be made to order. 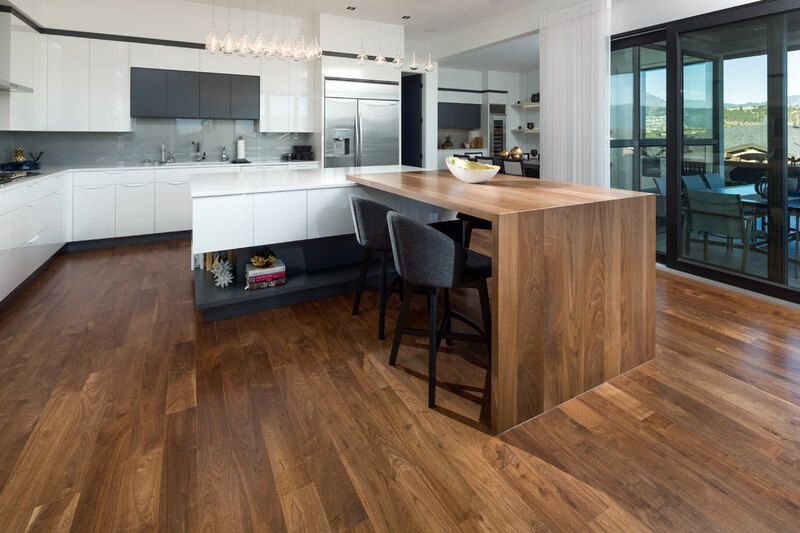 At Okanagan Hardwood Flooring, we have access to some of the finest mills in Canada and North America, and many specialize in wide plank flooring. choose from unfinished, pre-sanded and prefinished wide planks. offered in a variety of woods including: pine, maple, oak, cherry, ash, hickory, alder, fir, hemlock, walnut and birch. available in a wide range of widths and lengths, depending on which species of wood you choose and how clean a look you want. The cleaner the look, the shorter the board as mineral streaks and knots will have to be milled. out. Ranges anywhere from 4" up to 12" in width and from 5' to 16' in length. some species are available in quarter sawn and rift sawn cuts to highlight their distinctive grain patterns. if you prefer a beveled floor many variations are available - from a slight micro-bevel to a deep hand carved bevel. can be left natural for a modern look, or custom stained and distressed with hand-scraping. and wire brushing techniques to achieve an antique look. some exotic species like Brazilian Cherry are now available. milled from timber harvested from sustainable, managed forests. salvaged and re-milled from old schoolhouses, mills, barns and warehouses - even trestle bridges. Each board has its own unique character and history. reclaimed wood has the rich colours and characteristics found only in old growth timber, and these attributes can be intensified by staining and finishing with an eco-friendly hard wax oil. in choosing to recycle a valuable resource, reclaimed floors are having a positive effect on our environment, and the sustainability of our forests. An intricate medallion makes a beautiful focal point in an entry. A simple strip border around the perimeter of a room can accent the symmetry of your hardwood floor. 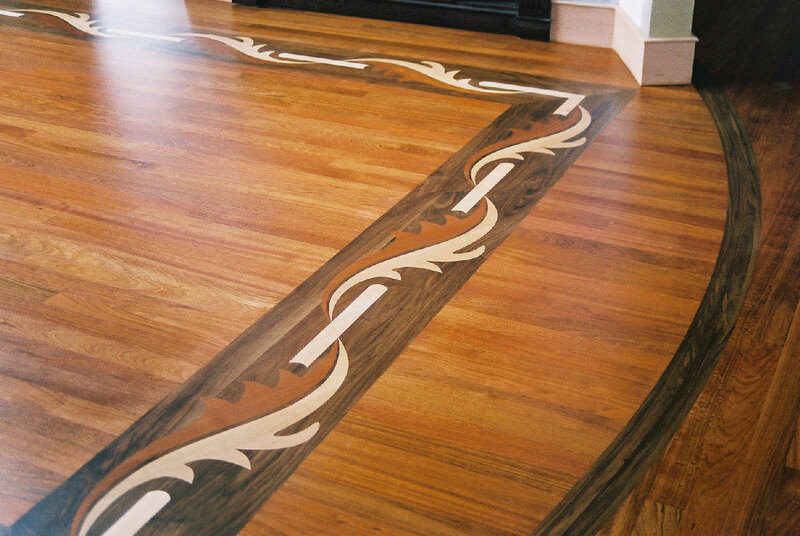 Allow us to assist you in developing an inlay, border or special design that will personalize and enhance the beauty of your hardwood floor. 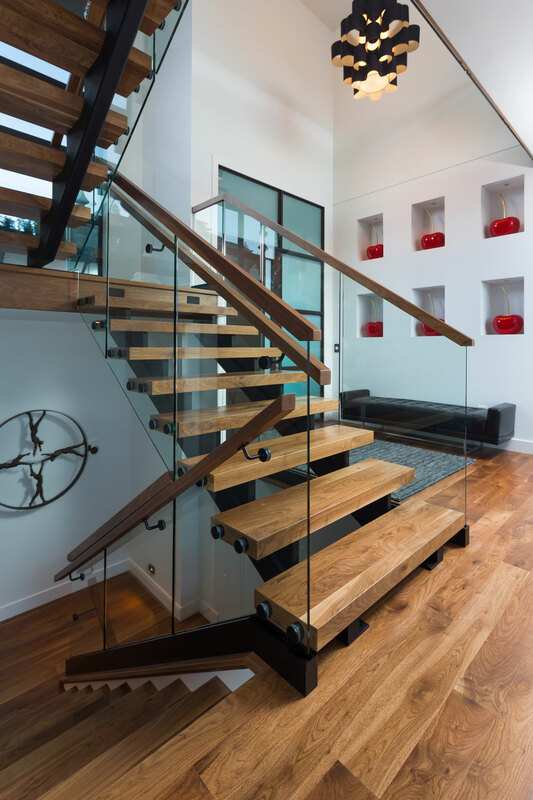 At Okanagan Hardwood Flooring, we also design and install stair treads and risers to compliment your floors. 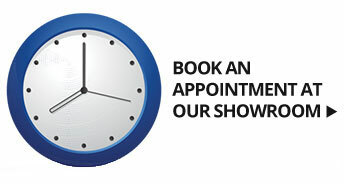 browse through our displays, or bring in your own sketches and ideas. choose from a wide variety of domestic and imported species of wood - Brazilian Cherry, Zebrawood, Birds Eye Maple, Purpleheart, Wenge and many more - all wonderfully different in colour and design. mix your materials - create a foyer design by surrounding a tile or stone inset with a picture frame of hardwood flooring. consider adding our custom-made wood stair treads and risers in the same. species and stain colour to match your new floor. add the finishing touch to your project with our solid wood air vents - available in all species, shapes and sizes. 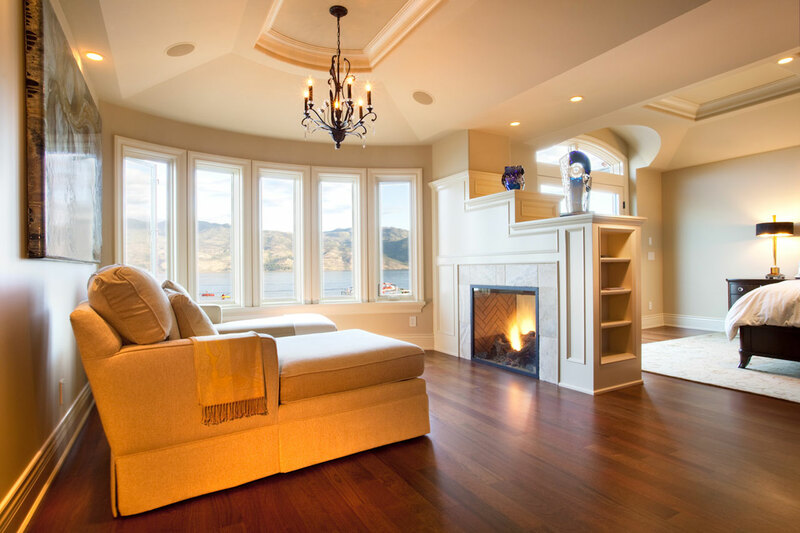 Okanagan Hardwood Flooring Company has been helping our customers maintain the beauty of their hardwood floors for over half a century. By using the proper floor cleaning products and following maintenance guidelines - area rugs in high traffic zones, removing dirt and grit from your floor, wiping up spills quickly - you can help maintain the longevity of your finish. But normal everyday living can take its toll on your hardwood floors, and after a few years you may notice that they have become dull and lifeless. One of the greatest benefits of having a hardwood floor is the ability to restore it to its original beauty. 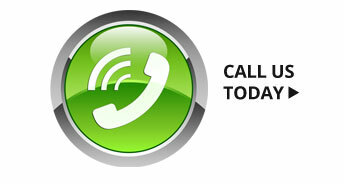 For more information on our Renew & Refinish process, click here.